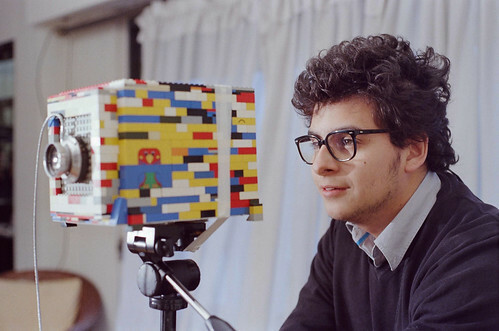 I got a flickrmail today from user Tomás Cortés Rosselot letting me know he'd build his own large format camera out of LEGO bricks! How exciting to see! Check out his stream for at least one example of shooting with it. I also ran across a link to a Polish blog called fotoklocek, apparently by run by a photographer called Emil Stankiewicz who has been having fun building cameras out of various stuff. For now, mine still looks like this (shown with a "focus lock" attached, and it's sitting on the top of a tripod by way of the previously mentioned tripod mount.